The Government in Canada has extended an invitation to as many as 3,000 Express Entry candidates to submit an application for seeking the Permanent Residence in Canada. On March 14th a draw was held where the minimum CRS score was just 456. This draw had a gap of three-weeks from the date of the previous draw. The feature of Draws held during the present year is that the number of Invitations to apply fluctuates in the range of 2,750 and 3,000, and the CRS scores require the low of 442 and the high of 456. With these developments, it will be a matter of interest to know the minimum CRS score and the date of the next draw. Immigration authorities in Canada made the use of tie-break rule for this draw. The time and date set for this tie-break was March 3rd, 2018, at 02:12:11 UTC. All candidates who had scored in excess of 456, the candidates who scored 456 and also had a profile in the Express Entry pool, earlier than that time declared, passed the eligibility norm to receive an ITA. It was the fifth draw to be held in 2018, which is the first year where the government is implementing the New Immigration Level Plan. The target set for 2018 is admitting 74,900 aspirants in Canada under the Canadian Experience Class, the Federal Skilled Trades Class, and the Federal Skilled Worker Class, administered by the Express Entry system. In the target for the present year under the Express Entry classes, there is an addition of 3,200 admissions For ITAs compared to the target of the previous year (86,023). In the months of April and May 2017, big draws were conducted and among them, the largest was held on April 12th, where 3,923 candidates were invited. IRCC has a huge task in its hands in reaching the 2018 and 2019 targets. Presently, it has issued 14,500 ITAs, during the first three months, and the measures adopted, by the Government, in meeting the targets, deserves a close watch. It needs to hold major draws more frequently if it desires to meet the target for 2018. The candidates who figured in the Federal Express Entry also gained benefit from the linking of Ontario based Human Capital Priorities Stream. This stream forms a part of the Ontario Immigrant Nominee Program and permits the province to look out for candidates from the Express Entry pool who score above 400 and fulfill other criteria. Ontario had opted for three draws during February, using the Human Capital Priorities Stream and had issued 1,088 invitations to apply, to the candidates who had sought a provincial nomination. In the present year, 1,808 invitations have been issued to these candidates using HCP Stream. They receive 600 additional points when they are successful in receiving a provincial nomination. 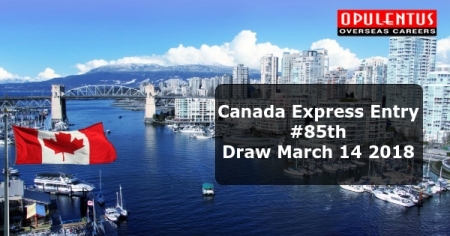 The Express Entry this year also saw the linking of Manitoba, British Columbia, and Prince Edward Island PNPs with it. The fact to note was that the candidates who had a Master’s degree and were proficient in the English language besides having work experience as professionals met with success. The present draw is an excellent example of the variation in the draws of the Express Entry pool, and the immigration resulting from it has to be watched.